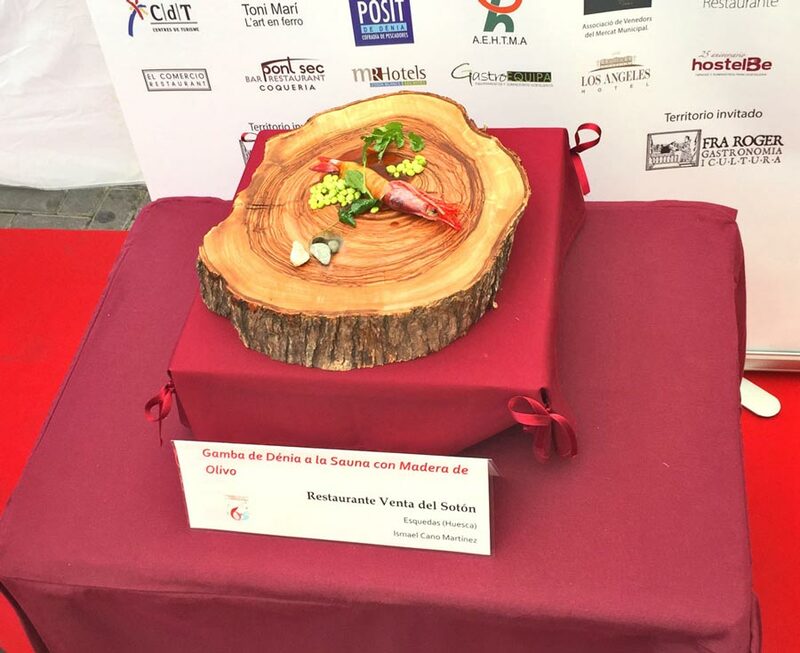 As we watch two fishing boats moving across the turquoise-grey waters of the Mediterranean Sea, we reminisce about the 6th International Creative Cuisine Competition of the Red Prawn of Denia. Even with today’s choppy waves, steady damp wind, and overcast grey skies, the local fishermen are busy at work to bring back to Denia’s markets and chefs, the freshest seafood along the shores of the Costa Blanca, especially the prized and delicious Red Prawns of Denia (or in Castilian Spanish, Gambas Rojas de Dénia). 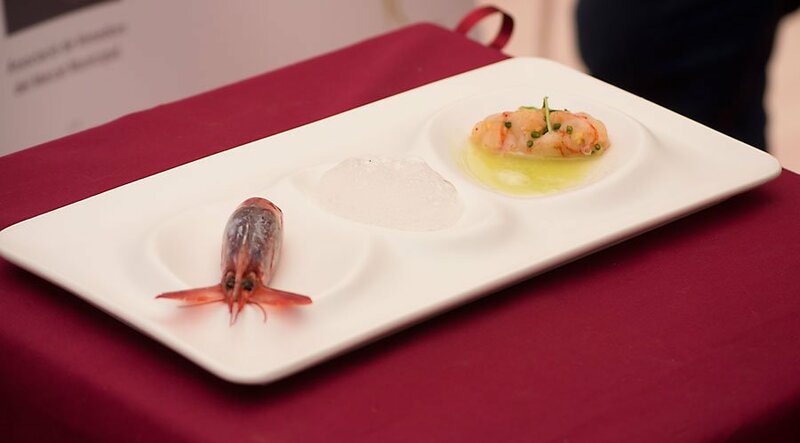 For such a small creature, they hold a big presence and importance here, which we learned firsthand from attending the 6th International Creative Cuisine Competition of the Red Prawn of Denia. What's so special about the Red Prawn of Denia? 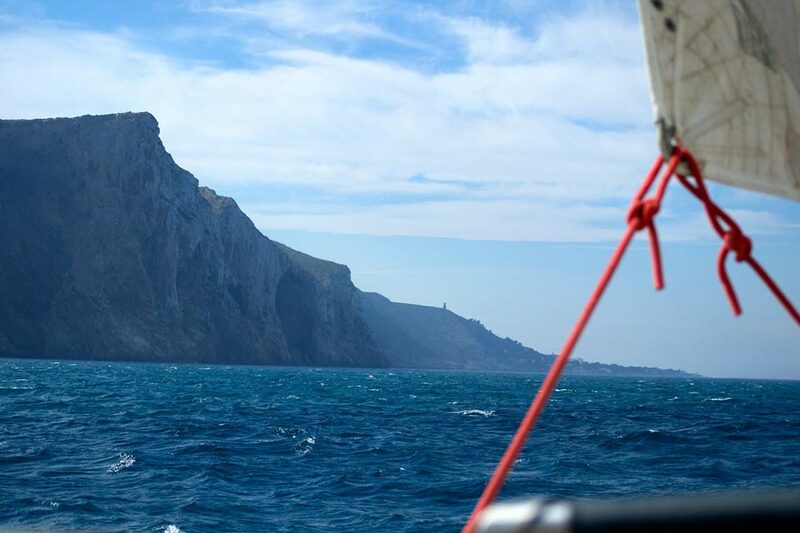 Denia’s coastline is already rich in natural beauty, with the best of both Mediterranean worlds – long, sandy beaches and rocky shores of coves and steep rock walls that plunge into the sea. Yet it is under the gorgeous, crystal-clear waters that the Red Prawns of Denia live. At depths of around 1,000 meters, these favorite delicacies thrive. 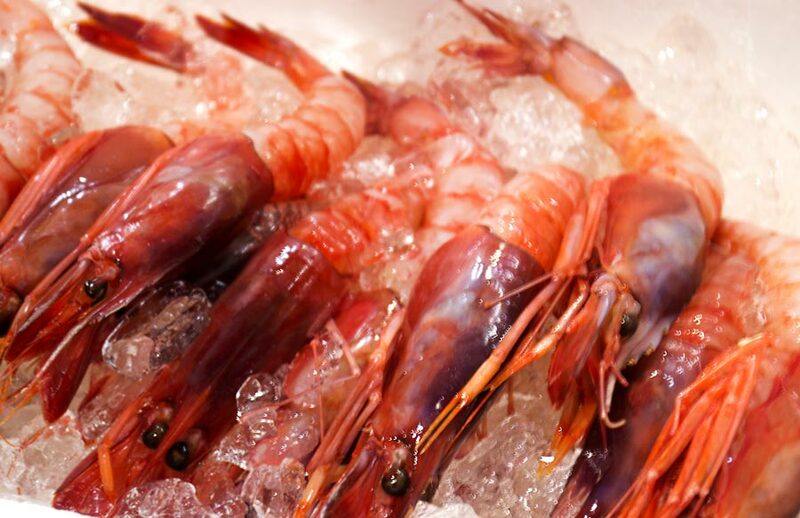 Here, the water is icy cold and the prawns have a bright redness to them that rivals other seafood. Light can’t reach these depths and there is little or no pollution, so they grow in a pure and optimal environment for their delicate, sweet tastiness that foodies and chefs crave. These little creatures have their own competition!?! With such an amazing taste, these prawns have managed to stir up a lot of attention for themselves! And with that certainly comes demand. They cost an average of 8 – 10 Euros each (market price). 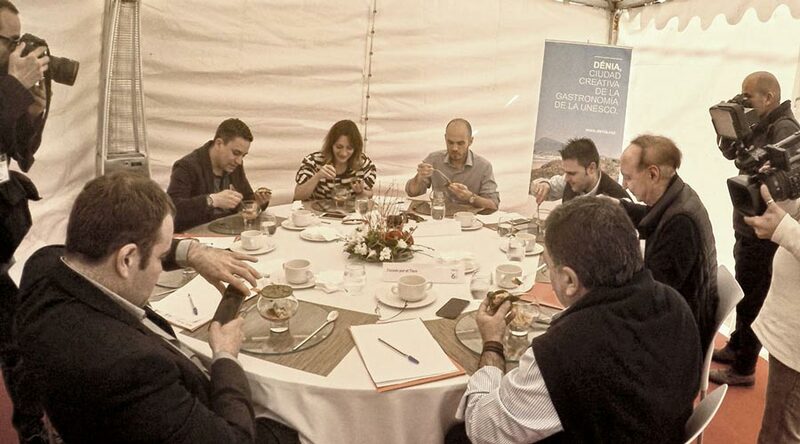 Since Denia is a UNESCO Creative City of Gastronomy, there is no better place to hold an international creative cuisine competition for these red prawns than right here in Denia, Spain. 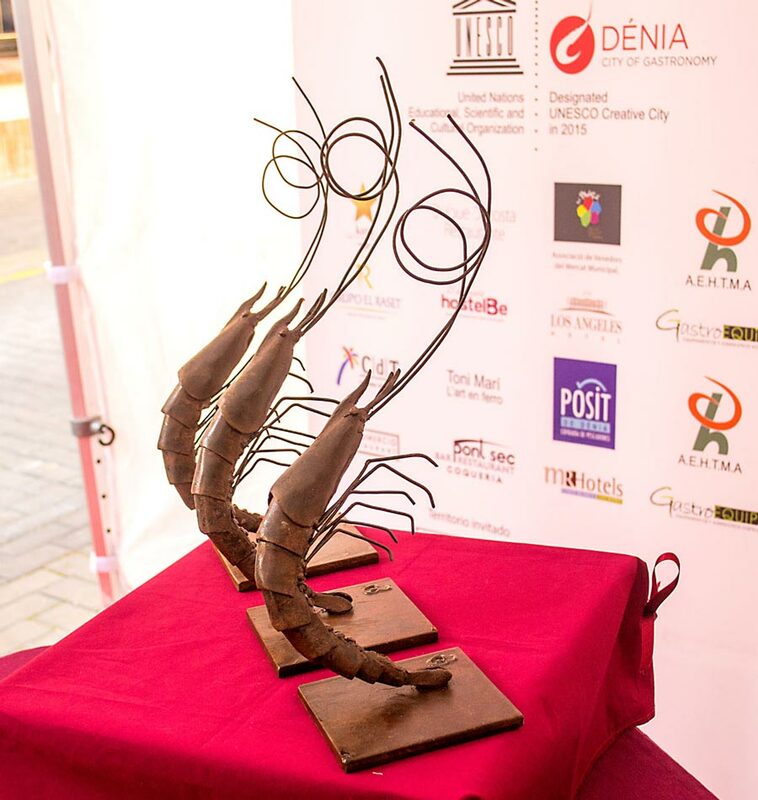 This year in February was the 6th International Creative Cuisine Competition of the Red Prawn of Denia. Out of 70 contestants, 8 finalists were chosen to compete. 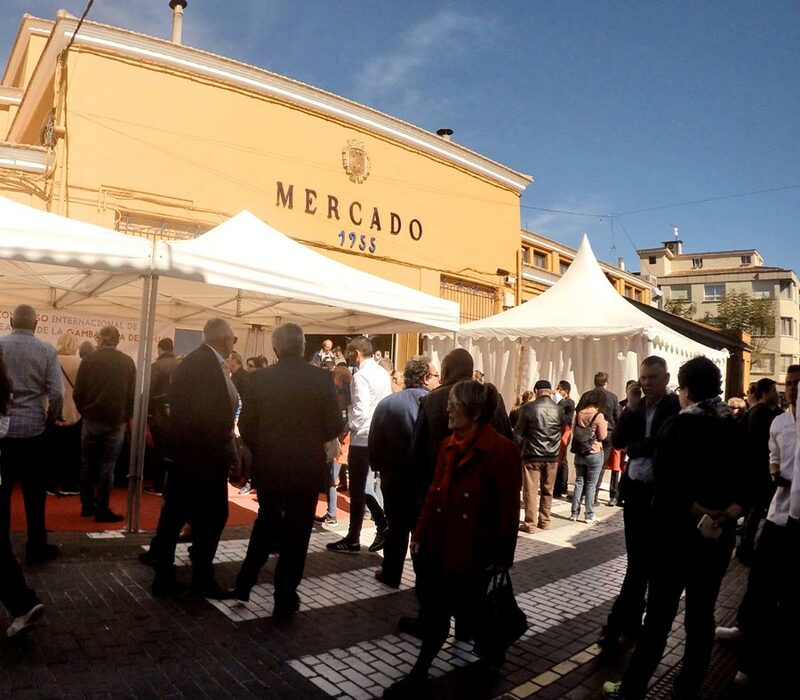 The event is live and was held at Denia’s Mercado Municipal (also referred to as the town’s Mercado Central). We arrived bright and early (by Spanish standards) at 9am to collect our press passes and start making the rounds. Javier, of Denia’s Office of Innovation & Creativity, was kind enough to spend the majority of the event with us, showing us around and explaining about the Red Prawn of Denia and how the competition works. He also introduced us to some of the people who help make this, and other great events in Denia, possible. In the very middle of the Mercado building were long tables that formed a rectangular area. Within the middle the chef finalists were at work prepping and later on, completing their dishes. It was exciting to go around and see the amazing attention to detail that was put into each dish. 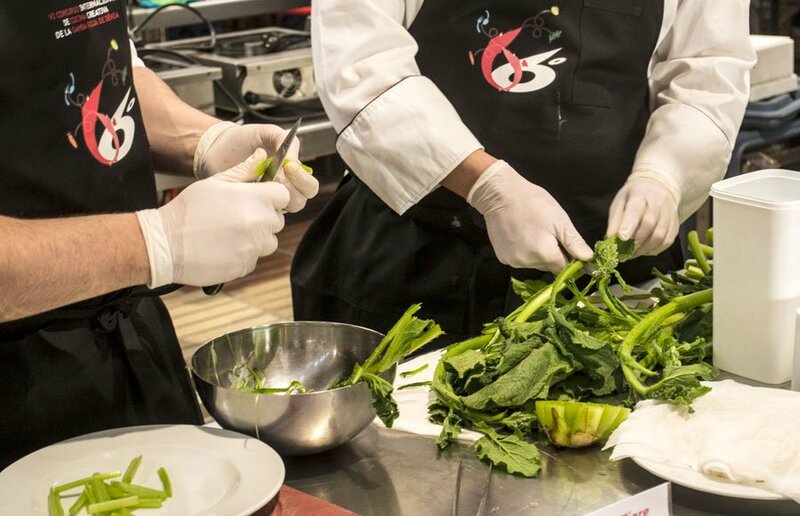 Each chef had come up with their own, unique recipe for the competition and everything about it had to be done fresh, right there. 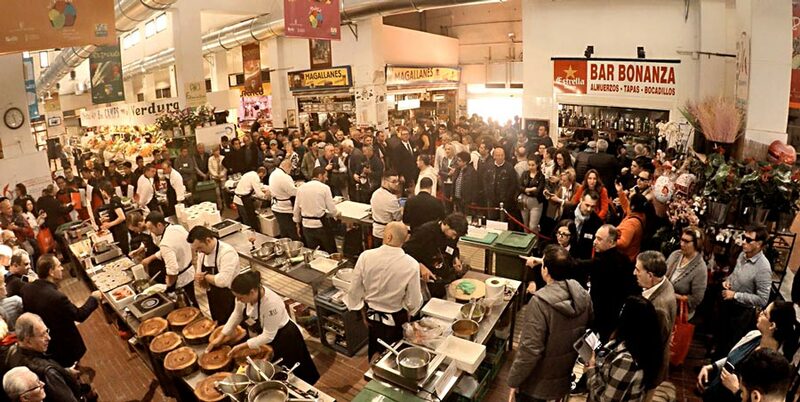 As the competition continued, more and more people were arriving and admiring the progress of each dish. Javier explained to us that the most important thing the judges look for, is that the Red Prawn of Denia is highlighted and emphasized well. It’s a fine balance and beautiful dance between accenting with complimentary flavors while featuring and not taking away from the fresh, distinct taste of the Red Prawn of Denia itself. Presentation was also very important, yet in a way that would not overshadow the visual element of the Red Prawn of Denia itself. After all, it’s already so beautiful and tantalizing to the senses, with its size larger than the average prawn and best of all, its vibrant red color. While the chef finalists competing in the competition are the highlight, there are other key players as well. 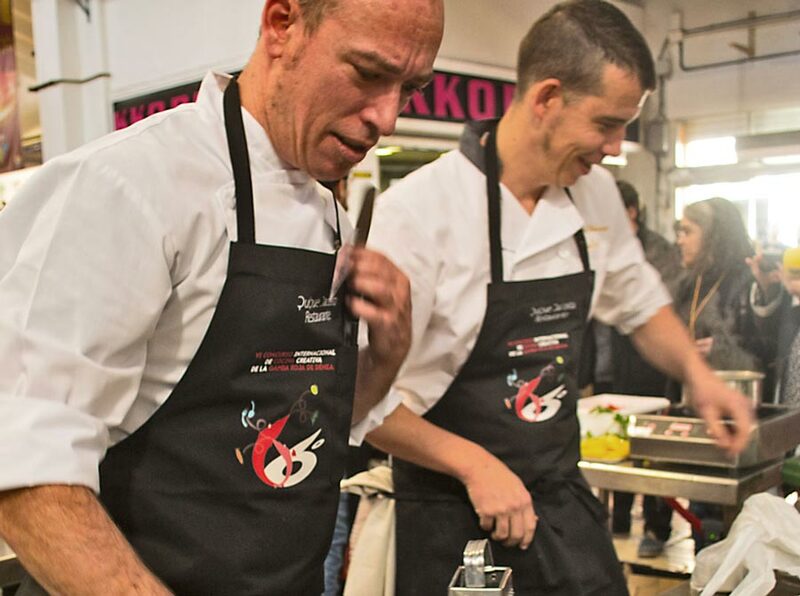 Chef Quique Dacosta, who has the 3-Michelin Star Restaurant Quique Dacosta here in Denia, was part of the pre-jury team who selected the finalists, as well as being involved in other ongoing aspects of this and other gastronomy-related events in Denia and abroad. He is also known for creating some sublime and creative dishes with the Red Prawns of Denia in his renowned kitchen. 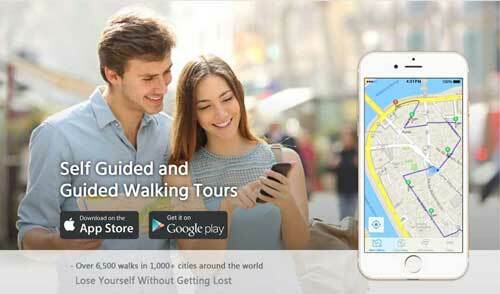 It’s pretty amazing what this small, quaint Mediterranean town holds! 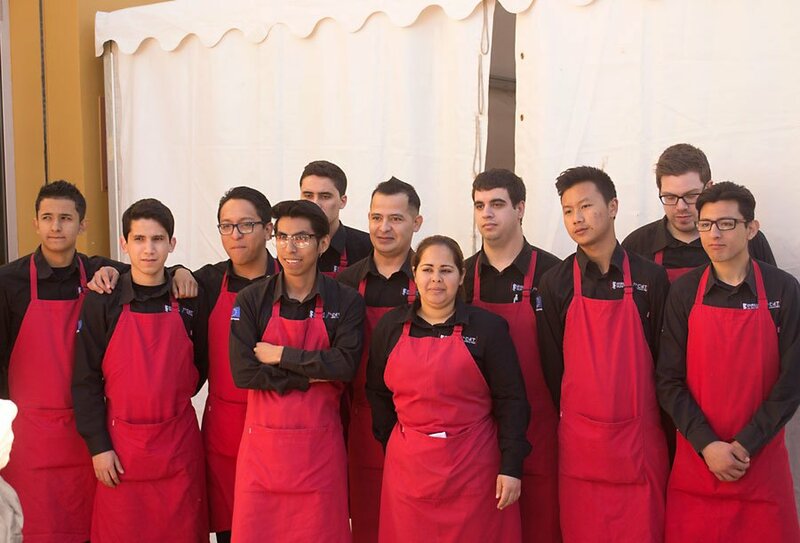 After a couple of hours of prepping and cooking, the dishes were completed with their presentation and carried to a small tent just outside the Mercado Municipal. Here, the team of judges tasted each plate and noted their observations, all towards determining the verdict of what dish would be awarded a prize. While watching the chefs prep and cook was certainly exciting, the delivery of the dishes was also one of the best parts of the competition. 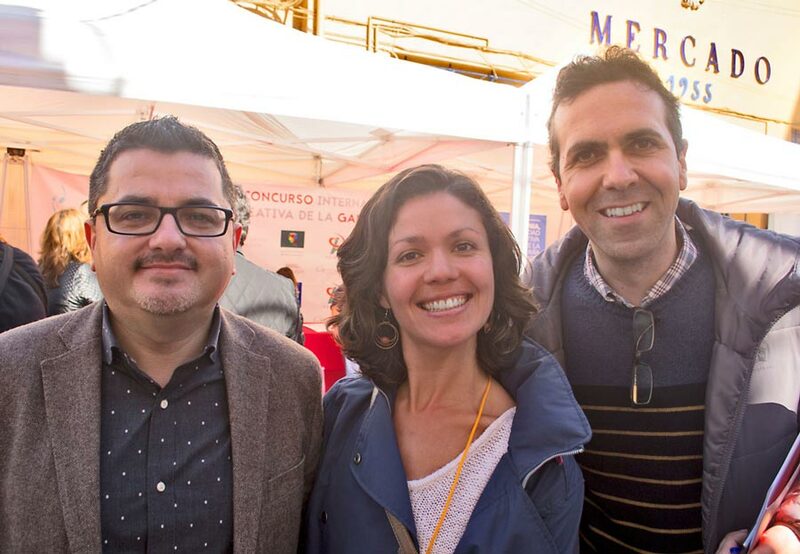 By this time, the Mercado was full of observers and photographers and the air was humming with curiosity and energy. A red carpet was rolled out for the path that the servers followed to deliver the dishes with ceremony to the judges. Each plate was so colorful and the smell of course was mouthwatering. Our favorite presentation that really caught our eye was the Gamba Roja served on a thick log plate that had steam rising up from stones placed in one corner. Talk about ‘wow-factor’! But of course, we’re not sure what it tasted like. From the 8 finalists, 3 winners were awarded. 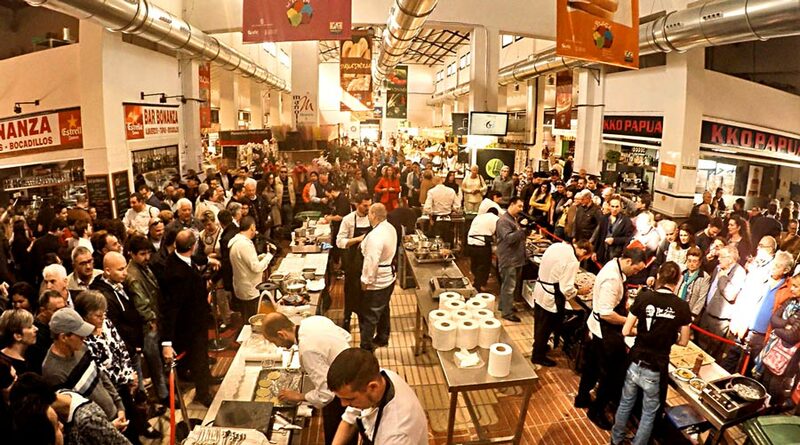 First prize was given to Chef Antonio Villaescusa of Restaurante Maestral in Alicante. 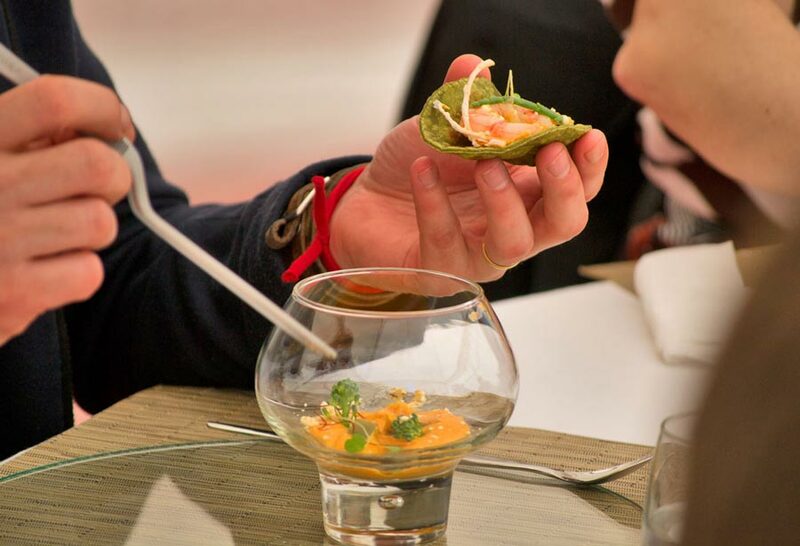 His recipe was the ‘Gamba Roja de Dénia con acelgas y gazpacho marinero tostado’ (the Red Prawn of Denia with chard and roasted sailfish gazpacho). Second prize went to Chef Antonio Rubio of Mesón Campero in Linares, Jaén. 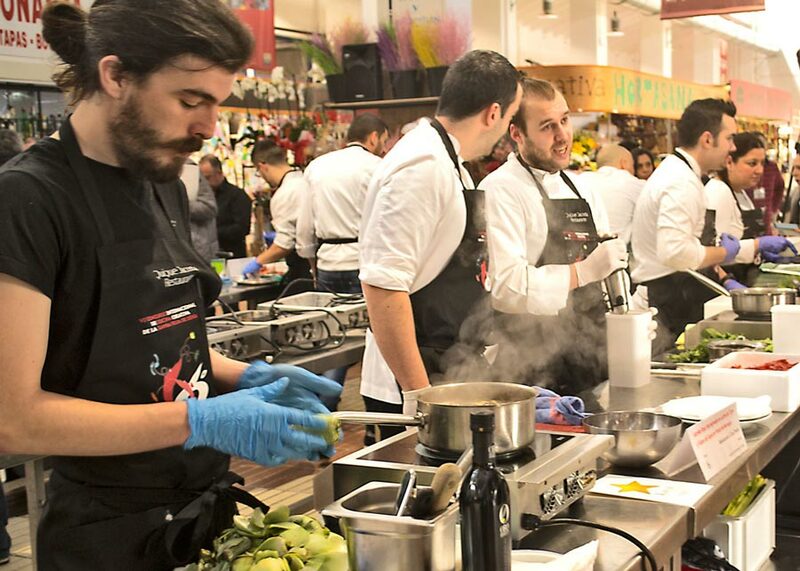 The recipe he created was ‘Gamba Roja de Dénia, sabayón de azafrán y AOVE temprano, sofrito de algas y alcachofas‘ (the Gamab Roja de Denia with saffron, young extra virgen olive oil, and seaweed and artichoke sauce). 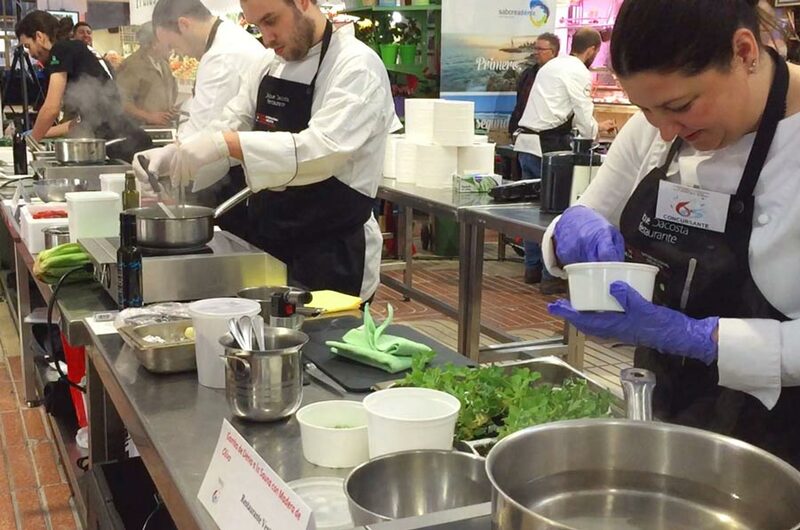 Third prize was awarded to Chef José Primo of Restaurante La Borda d’Costa in Puerto Sagunto, Valencia. 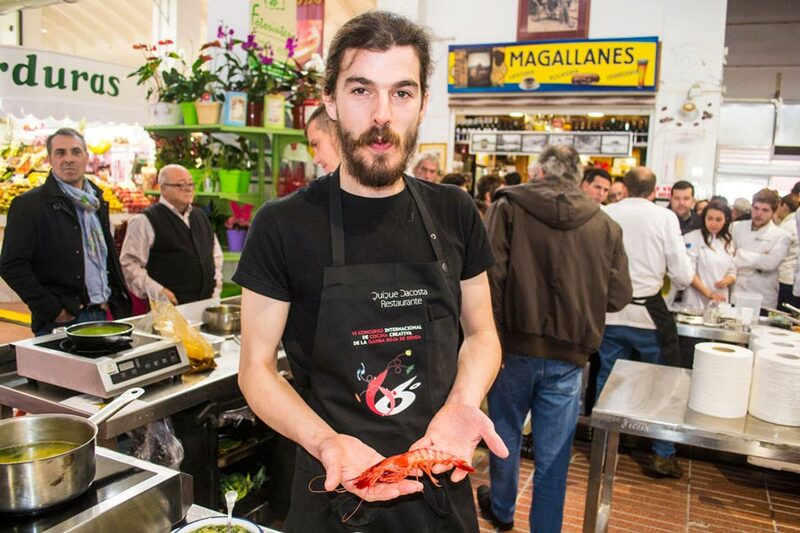 His recipe was ‘Gamba Roja de Denia y Tradiciones’ (Red Prawn of Denia and traditions). 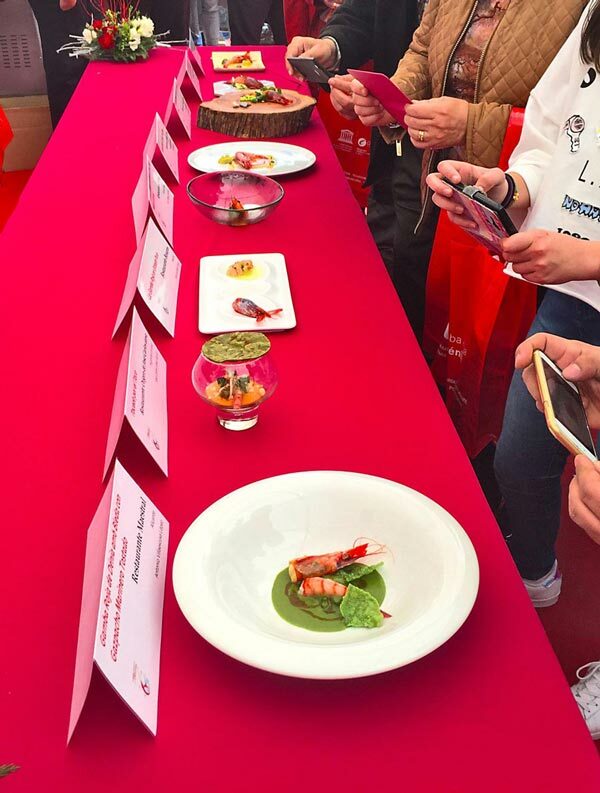 We loved the 6th International Creative Cuisine Competition of the Red Prawn of Denia, and look forward to next year’s event as well. It taught us so much about why these little creatures are such a big deal here, for the locals and foodie-visitors alike. But most importantly, the Gamba Roja de Déniais becoming more and more sought after by up-and-coming and accomplished chefs. Wherever it is enjoyed, it certainly has become recognized as the ‘main dish’, however it is savored. Its fresh quality and superb, distinct flavor makes it the star of the show and is in no need of fancy presentation or complicated flavors. 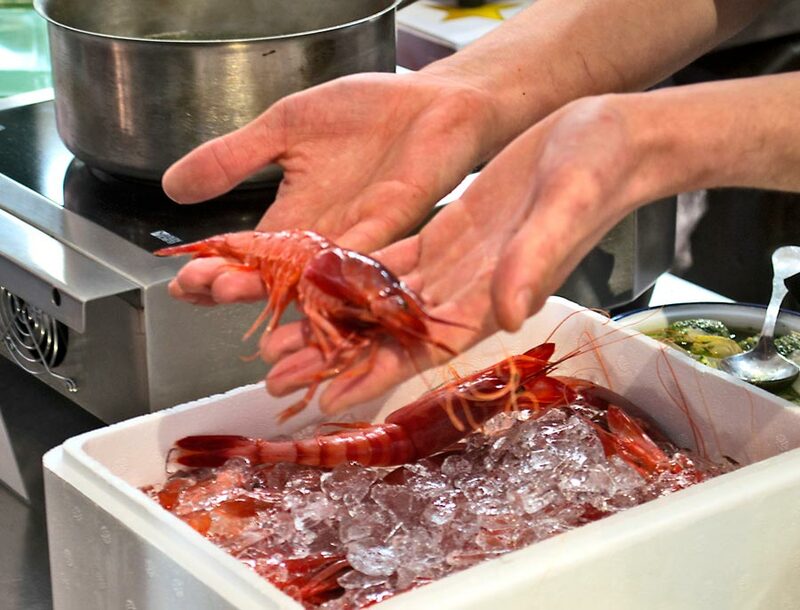 The Red Prawn of Denia is another emerging treasure of Denia’s culinary heritage being preserved and passed on with creativity and appreciation. 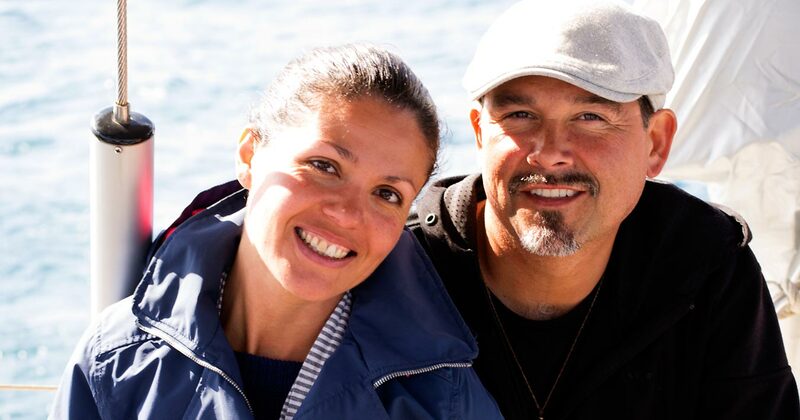 Image Above – Our thanks to Floren (left) and Javier (right) of Denia’s Office of Innovation & Creativity. 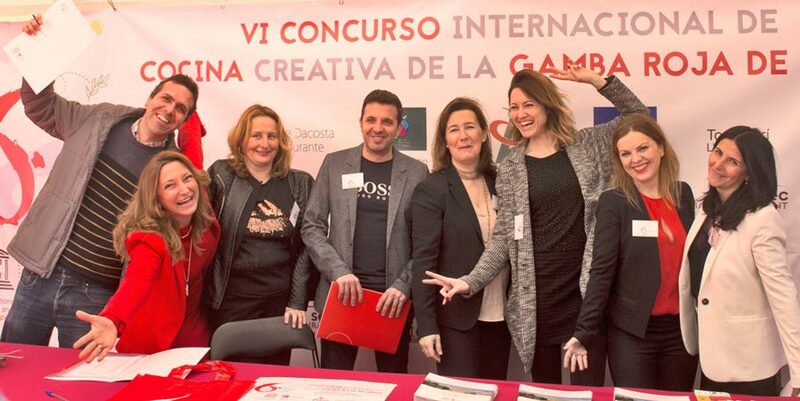 Our thanks to Denia’s Office of Innovation & Creativity for introducing us to the International Creative Cuisine Competition of the Red Prawn of Denia. And a special thanks to Javier for spending time guiding us through the competition and teaching us so much.